In this article we will work with the concept of websockets, which is a new addition to the HTML5 specification, this, in turn, allows a web server to connect to the browser and communicate directly with him. With the communication completed, the initial HTTP is replaced by a Websocket connection using the same connection TCP/IP underlying, as of this moment, any party may start sending data. With Websockets, data transfer can be made without the occurrence of overloads associated to the HTTP requests, therefore, the data is transferred through a Websocket as a message, consisting of one or more frames that owns the data that are being sent. In order for the message to be reconstructed in an appropriate manner, to arrive at the client, each of the frames is pre-set with a size of 4 to 12 bytes of data payload. Using this system frames based messages there is a significant reduction in latency and the amount of data that would be sent in a single packet. It is important to note here that the client will only be notified of the new message since all the frames have been received and the original message payload has been rebuilt. In order to understand better about the concept of Websockets, nothing better than learning performing the development of a simple example for that, from now on we will present some of the most important items and the common use of Websocket in HTML5. To start with our example, first we choose the IDE that we more adapt ourselves to the construction of our code at this time, so we will use Netbeans, but feel free to develop the way they see fit. That said, first we create our index.html page, according to the presented by Listing 1. Listing 1. Creating the index.html page. At this time, we have created some key elements that will be used by our application, among which, here we have a <div> responsible for the display of messages on the connection status; beyond, we have a list that will be used to present the messages sent and received from the server; and also, we will have a form for inserting messages that are sent. Now that we have our index.html page created, we realize that we will also have to create a CSS file, we call style and a js file, we call app.js, which are presented according to Listings 2 and 3. Listing 2. Creating style file style.css. Listing 3. Creation of the app.js file. As shown, we create here a number of variables and initialize them for the search of the key elements on the page. Thus, we have the beginning of our application, where we have a demo application configured and so we can start learning about the WebSocket API. At first, we see here how we can make a connection through the WebSocket. To create a connection there will be no difficulty, where all we need to do is call the WebSocket constructor and pass the URL of the server that will be used, as we see from the following code which we will include in our app.js file, as shown by Listing 4. Listing 4. Opening a connection with WebSockets. The website echo.websocket.org is adefacto test bed for websocket-based applications and services. We will use it as the server side to build our examples.Once we have established the connection, the open() event fires to our WebSocket instance. In our application, what we are doing is to add an event listener that will update the status of the <div> with a message, showing that the connection is established. Now that we have our connection, we will add this code snippet in our app.js file, as shown in Listing 5. Listing 5. 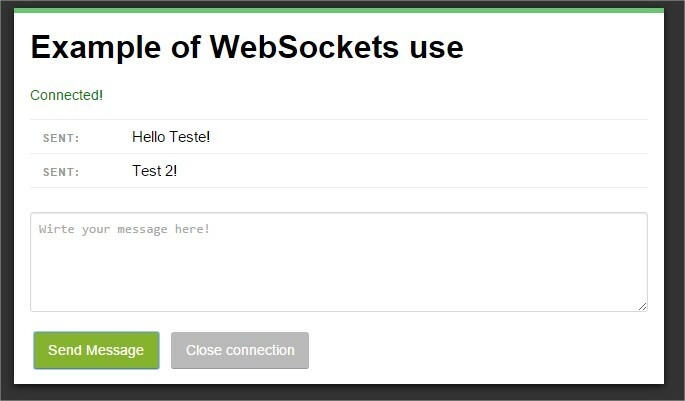 Showing an WebSocket opening message. With WebSockets we can also retrieve errors that may occur during a Listener that starts an error event. In our case, for simplicity, we are only presenting these errors in a console through the code presented in accordance with the Listing 6. The result of this implementation can be seen in Figure 1. Listing 6. Code regarding errors. Figure 1. Result of connection test. With Websockets, we can send both text and binary data. In our example, we will send the contents of the field to the server when the form is submitted. So we can do this, we must first have a Listener event set in the form, which we will do according to Listing 7. Listing 7. Sending the form data. // Recovering the textarea message. // Sending the message through the WebSocket. // Adding the message in a sent list. // Cleaning the field with the message after the sending. When the form is submitted, the code presented by Listing 7 aims to regain the message of the field txtMsg and then send it through the WebSocket. The message is then added to the mailing list called msgList and displayed on the page. You can see the final result in Figure 2. Figure 2. Final result of the test. With this we finish our article about using WebSockets, where we saw that it aims to set a persistent bi-directional communication between web servers and clients, which means that both parties can exchange messages data at the same time. They are optimized for high performance and results in more responsive and rich web applications.